In Christopher Bamford's Introduction one can find gems of insight and wisdom acting like a trailer for an upcoming blockbuster movie, a movie which will feature each of us in our time between death and a new birth. Bamford illustrates a special process happening then in which we will each receive our I-consciousness, our own individuality. He points to an earlier knowledge of this process in the Middle Ages, and calls it "the triumph of spiritual existence over bodily existence." Steiner will give more details of this process later: how our death is a mirror image of our birth. We receive our I upon birth and look out into the world of physical reality around us. Upon death, as the Earth receives the warmth of our body, we look inward upon the event of our death and observe the magnificent birth of our I in the spiritual world. The so-called dead are alive in the spirit world and separated from us by a thin veneer of consciousness, but nothing prevents them from perceiving our thoughts of them. If you are an art lover, you know the feeling that looking upon a great masterpiece of art causes to arise in you. Bamford points out that our loved ones experience our love for them as we would experience a great work of art. [page xviii, Introduction] Indeed, our love-filled thoughts are	to them what art is for us on earth: they are something additional that	is at once superfluous and uplifting, delighting, warming. In fact, for	the dead our thoughts are more powerful than art is for us, for they	cognize them with feeling and will, not thinking — as we, too, must	learn to cognize with feeling and will. Think of what this means! Oops, that was a slip. Only art critics think of an artwork! Thinking is a shallow image of the deeper processes of feeling and will, and it is these processes which our loved ones receive when they experience our love for them. [page xix, Introduction] At the same time, just as when we incarnate we envelope ourselves in earthly elements, so in excarnating after death we envelope ourselves in those higher spiritual elements into which our present nature will metamorphose in the future course of evolution (as described in Theosophy): first with the "spirit self," which allows us to relive our last earthly life in reverse; then with the "life spirit," which enables rhythmic movement in the spiritual space; and finally with the "spirit human." Thus, whereas on earth, the I stands "above" the physical, etheric, and astral bodies, after death the I, enveloped in the astral, stands "below" the spirit self, life spirit, and spirit human, which takes over to lead the I when the astral body departs. There are no innocent victims when some violent act occurs. I have come to understand this as a reality in life, a reality that the majority of humans would disagree with mostly because of their shallow understanding of the process of karma. Large scale disasters, such as hurricanes, are attracted to an area by some need in the collective psyches of the residents(2). If there are no innocent victims, then there are no such things as accidents either. We will always find that in the past this person has experienced through the lives between death and rebirth and through various circumstances in repeated earth-lives up until the unfortunate event that the I-consciousness developed for the purely spiritual world needed strengthening, invigorating. And this invigoration occurred by the person's physical life having been ended, not from within, but from without. Thus the needle of karma weaves its way through the threads of our lives. Each event in our lives brings us together with someone we had a relationship with in a previous lifetime and the needle of karma has woven us together into one event. "What goes around, comes around" is a meaningless expression unless we understand its truth lies in the needle of karma weaving two or more lifetimes together. Do we need the ability to see into the spiritual world, view previous lifetimes perhaps, in order to perceive karmic relationships with others in this lifetime? No, whenever you meet someone and feel the slightest attraction to the person, you are likely perceiving a karmic connection. We are so accustomed to viewing reality through our five senses, we discount the existence of other senses in us and the existence of reality that is imperceptible to our five senses. [page 2,3] Contemporary humanity is used to looking at the environment in a purely material way, and therefore forms ideas from this purely material view. Thus it is difficult, above all, for us to penetrate the spiritual world, even with our imagination. Many believe that an understanding of the spiritual world cannot be gained if one cannot see into it. They believe this only because they have made their thoughts inflexible and desolate as a result of becoming too accustomed to thinking only of the physical world. We do not remember the experience of being born into this world, but have the possibility of remembering the experience of our death. The I-consciousness which we develop some time after acquiring a physical body upon birth, appears to us again after we have laid aside our physical body upon death. [page 5] What remains as a result, as a consequence, of the experience of the departure of the physical body from our total being? Were we not to have the experience of consciously participating in the laying aside of our physical body as we cross the threshold of death, we would never develop an I-consciousness after death! I-consciousness after death is stimulated by our experience of the departure of the physical body. It has great meaning for the dead: I see my physical body going away from me. I perceive the feeling growing within myself from this event that I am an I. We could also state this paradox in another way. If we could not experience our death from the other side, we would not be able to have I-consciousness after death. Just as the human soul comes into being at birth, or even at conception, and adapts gradually to using a physical body and thus achieves I-consciousness within the body, so does the human being achieve I-consciousness after death from the other side of existence by experiencing the falling away of the physical body from our total being. The experience of our death, which many tremble over, when experienced from the other side in the spiritual world, is a beautiful experience. [page 5] But, although we cannot witness our birth into physical life, if we become fully conscious after death we will always have the event of our death immediately before us. The event of our death is not frightening in any way, but is rather the greatest, most splendid, most beautiful experience that our soul can have. Death then shows us continuously the great fact that our consciousness, our self-awareness in the spiritual world, originates from death; that death is the stimulator of this self-awareness in the spiritual world. We need the spiritual world to create art. Without the inputs from the spiritual world, what we call art would be bland imitations of the physical world around us. In every piece of art, one can spot aspects of something not observable in the material world. If we were to forget about our loved ones after they died, we would be relegating them to as bleak an existence as we would have if art did not exist in our world. When we think of our departed relatives and friends, we bring beauty into their existence in the spiritual world. [page 14, 15] It is a very special realm for the dead, looking into the thoughts of those who love them and stayed behind. It is a special world for them. If one could experience the world here only as what comes into being physically in the mineral, plant, animal, and human kingdoms, then there would be no art. Art is created in addition to, beyond, what we actually need physically. Those who understand at all the evolution of humanity as being spiritual know that art cannot be absent from the world, in spite of the fact that even if there were no art, nature would be just as complete as it is now. If necessary, the dead would have to live in the way that incarnated human beings would live in a world of nature, bleak, dead, and bare without art. The dead would have to live in this way if they were forgotten immediately after their death by their loved ones. What is seen in the thoughts left behind in the souls of those who love the dead is certainly added to the world that the dead need directly, but it also elevates, improves, the existence of the dead. We can compare this, in a sense, to art in the physical world; but these thoughts are uplifting, an improvement, in a far superior way for the dead than the improvement in the physical world for us through art. Materialistic thinkers abound in our world today and revel in making fun of people of earlier times, calling their writings and artworks fantastic and foolish. Steiner realized this and did his best to point out the reality which early people lived in often is substantiated by the observations of spiritual science today. [page 16] Materialists are firmly rooted in the physical world when they say that those who do not think as they do are fools. There is no greater inner intolerance than that of materialistically-minded people. Such people basically always think that in earlier times people believed that all kinds of spiritual beings were present, that they did hardly anything in life without conjecturing or even seeing spirits everywhere. But the materialist claims that all that was meaningless fantasy, and that finally humanity has come far enough to have abandoned this childishness. And yet it is possible for people to notice at every turn how nonsensical such an idea actually is. The idea that Lucifer could be portrayed by an early artist as a snake with a human head would be laughed at by materialists today. Laughed at by materialists who do not understand that humans today carry Luciferian impulses in them today which sit in our head and into the spinal cord which leads down from our head. 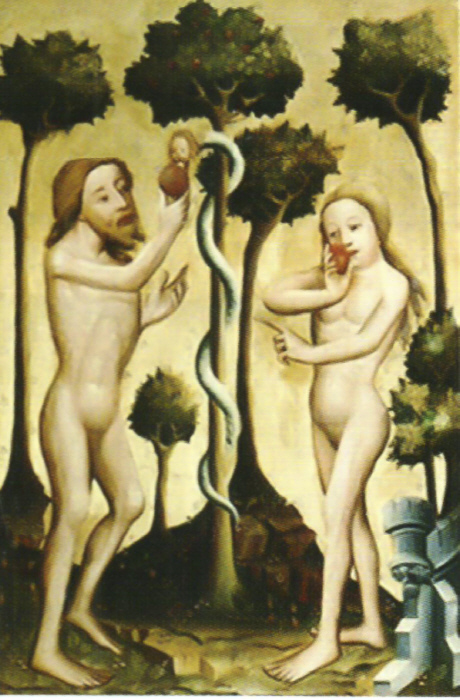 Steiner directs skeptics to view a painting by Meister Bertram which portrays Lucifer as a snake with a human head(3) offering an apple from the tree to Adam. Materialists today are like horses with blinders over their eyes to keep them from being spooked by the shadows of the city streets they walk through. But they have only to observe the Bertram painting to be enlightened to the existence of spiritual sight of artists during the Middle Ages. [page 18] Whoever goes to the art gallery and looks at this painting of Paradise by Meister Bertram has fully valid proof, brought to the outer physical plane, that it really has not been so long ago that people could see into the spiritual world with atavistic clairvoyance and knew its secrets in a much different way than we know them in the present. Just think how blindly people move through the world today; if only they wanted to, they could see for themselves externally on the physical plane that evolution is present in humanity. When we have expanded our understanding of what it means to be a human being to include the time we live in the spiritual world between death and a new birth, an amazing thing can happen. We can come to see that we live in the middle of eternity at every moment of our lives! Eternity is not some unlimited stretch of time in front of us, but it exists in the now! Spiritual science offers a realistic view of the world in contrast to the dust-to-dust view of materialistic science. [page 22, 23] What boundless enrichment we experience through what spiritual science can give us. The world is expanded little by little because to the physical truth of the evolution of humanity is added spiritual truth. In this materialistic age, we are cut off more and more from the world in which human beings exist between death and rebirth. Through spiritual science we must again live together with the whole human being, even when the human being doesn't have a physical body. Our materialistic world offers us nothing of this. We have an expression, "Only the good die young," which has appeared in various pop songs, mostly without explanation. If we look at what spiritual science reveals about young deaths, we can understand how a person dying young benefits our society, adds something good to it, and therefore such a person could be considered good by virtue of their early death. An unconscious knowledge of this spiritual fact could have led to writing the above expression. [page 23, 24] In order to really penetrate the world in which the eternal lives, spiritual science is essential. Spiritual science shows us, among other things, that those who leave the physical body early, before the usual age for the physical plane has run its course, who give their etheric bodies to the etheric world, live on in their individuality. Spiritual science also shows that such an etheric body, which could have continued to support the physical body for decades when it was consigned to the etheric world, still has life forces, and it is present in the etheric world, as I have shown you through examples. In our physical form on Earth, our etheric body is inside of us. Immediately after death the memories of our etheric body are arrayed around us like a life tableau, a living tableau of our life's experiences. But soon we separate from the etheric body, and what was inside us is woven into a sphere outside of us, much like an orb spider weaves from inside its body a silken orb which surrounds it. [page 30] The detaching of the etheric body takes place, as we say. One now has as outer form what one had experienced inwardly with the etheric body. What was experienced inwardly is now outside of us and grows bigger and bigger, and weaves itself (that is actually the correct expression) into the spiritual world one has just entered. But in the spiritual world, the void emptiness of which I have spoken remains, and the etheric body weaves itself all around it externally, and becomes bigger and bigger. What effect might the etheric body from a young person have on the people surrounding him? Reading these passages gave me a chance to consider the various young people I knew personally who died young. One was Bonnie, my first friend in the first grade who was run down by a vehicle in the middle of the year. Later there was Tommy who was my first friend in a new school in the tenth grade. Like Bonnie, he died in a vehicle accident before the year was over. Rather than bemoaning the tragedy of losing these friends, I can now imagine some benefit came to me from my friends after they died. [page 31, 32] The etheric body of a person who dies at a young age could possibly have worked within the physical body and sustained the physical body for decades more. Energy in the spiritual world is not lost any more than it is in the physical world. That is, if the person dies at twenty or thirty years old, a force is present in the etheric body from which the person is released after death that could have sustained the person's physical body for decades more. This etheric force is no longer within a physical human body; it is outside in the world. Steiner gives us an example of a boy of seven who was crushed by an overturning truck near the Goetheanum while it was being built in Dornach(4). How did his etheric body affect the building and the workers there? [page 32, 33] The people who were driving the furniture truck had nothing with them to lift it, and simply left. They wanted to wait until the next day to lift the truck. But, of course, we had to lift it that night, and we found the dead child underneath it. Thus in the time after his death, this little boy had been in the surroundings of the building for a while. Now it is really true that in the time after his death, his etheric body was interwoven into the building's aura. It is surely not immodest to say that whoever, like myself, is involved in the artistic aspect of the building notices how the stimulation one needs to integrate various things artistically into the building comes from this child's unused etheric force. One of the goals of Steiner's spiritual science was to enable others to notice such stimulation of the physical world which comes from etheric forces. [page 33] In future times, there will be people living on this European soil who will be able to live in a spiritual, an etheric, atmosphere where these unused etheric bodies exist. And when there are people on earth who understand what lives spiritually, not just as abstract memory but as true etheric forces — we will be able to have this understanding only through spiritual science — then they will no doubt feel the inspiring forces of what is present from these etheric bodies. The process of kamaloka is described in many places by Steiner as a time after death when we spend approximately the amount of time we spent sleeping during our life on Earth doing a remarkable inversion of our life. All the interactions we had with others, we reprise in a backwards form. We go backwards through our life's interactions in time, traveling from the time before we died to birth. When we interact with someone during kamaloka, we experience how they felt during our interaction, and we learn in a very personal way the effect our actions had on other people. In this lecture Steiner reveals that kamaloka is a result of our spirit self pressing in from all around us when our etheric body leaves us, taking with it the life's tableau we had been experiencing. [page 33] We first envelop ourselves in a sort of spirit self, which is formed in a slightly different way than all that is formed when we are here on earth. One could say that the spirit self is something that presses toward us from all sides, and we feel as if we are at its center. Then we settle further into the other members of our human nature by experiencing at the same time a sort of spiritual course moving backward, as I have described now and again. We experience a sort of antithesis to earthly life, but now in a much different way than through the pure tableau I described. This antithesis is called kamaloka in various eastern teachings about the time after death. Here, in detail, Steiner describes how we experience this kamaloka process. [page 34, 35] This spirit self is a sort of driving force. It leads us back, so that we experience our last earthly life in reverse, from death to birth; we really move backward. For example, here on earth if we say something to a person and harm that person, we experience that event in our physical body from our own point of view. We cannot experience it from the standpoint of the other person. We would not be able to live in the physical body at all if we wanted to live otherwise than having our own experiences. Let us take a case in which in order to get revenge, someone hurts a person very badly by saying something. Here one does not experience what the other person feels or senses. With our going backward after death, which I just described, we experience in the spiritual world what the other felt, always as the effect of what we have done. That is, there we live within the world of effects. We experience, in reverse order, what others have gone through with us during our physical life, completely separate from ourselves, until we come to the point where we have reached birth. Remember that our individual life spirit will not be fully present until we reach the Venus stage of evolution, but during this time in the present Earth stage of evolution, by going through kamaloka, we have immersed ourselves into a version of spirit self which will come to us fully after the Jupiter stage, and we are ready to envelop ourselves in a version of the life spirit which will come to us later during the Venus stage. [page 35] When we have put aside our astral body, we realize that we are enveloped in life spirit. We were enveloped by life spirit the whole time that spirit self was leading us back. But only now do we notice it. We notice it only after we have gone through the whole process called the kamaloka period. Without the life spirit, we would die perpetually in the spiritual world. We live within our skin during the Earth stage of evolution, but we have no such body in the spiritual world, so we must depend on the life spirit now to exist. We are not ready to expand to the fullness of the universe because if we did succeed in doing so, we would be reduced to nothingness, so we must remain as a localized spirit. The life spirit takes over moves us around the universe during this time. [page 36] That is how we leave one place and arrive at another. However, this happens rhythmically so that we always return to the same place. But we must be led around in the spiritual world. A spiritually dynamic life develops for us. Here, as physical individuals, we are for the most part stuck in one single place. Something of the spiritual is always carried into the physical; and thus we are able to move around on the physical plane. This is essentially an ahrimanic effect because the spiritual is carried into the physical by Ahriman. But after death it is right that we are led into the spiritual through the whole associated world organism, and in this way, we settle into the whole environment surrounding earthly life, whereas here on earth we settle into one place. While we are being led around through the spiritual world organism, we receive forces which infuse us with a desire to return to another earthly life. 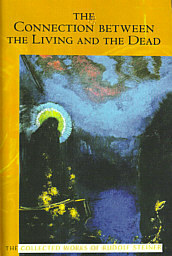 Steiner refers to his Vienna lecture series contained in this volume, Life Between Death and Rebirth, GA#140. [page 36] The first half of the life between death and rebirth proceeds in such a way that we make our way away from our former earthly life; in the second half, we find ourselves preparing for a new earthly life. In a droll metaphor, Steiner explains our individual soul passes through our ancestors on its way to incarnation in this lifetime, but it does not grab specific attributes, such as genius, only general tendencies. [page 37] The soul naturally passes through all its ancestors in a certain way, and thus everything that it drew from those ancestors is attached to it. Just as someone who has fallen into water is wet, so, too, do we have the characteristics of our ancestors as we go through the generations. Steiner states that people have souls, and he emphatically denies the claim of this book, The Philosophy of As If, that people only act as if they have souls. I read the "As If" book twice, in 1979 and again in 1988, and did not get anything useful from it. I suspect the idea of Vaihinger's 1913 book was grabbed onto by materialists and used to discredit the validity of an individual soul by replacing the soul with the mere appearance of a soul. Likewise, Steiner decries Fritz Mauthner's view that history is a series of accidents, saying that would only be true if what happened in the spiritual world during the time between death and rebirth did not affect the course of history. [page 39] We weave, as it were, between death and rebirth what happens here on earth; we weave only according to those impulses that come to us from the spiritual world. [page 40] Science does not force materialism on us; quite the opposite. True science today justifies spiritual science all around. Today's materialism is completely dependent on people's having no inclination toward spiritual life, on their having no interest in, or any appreciation for, spiritual life. Understanding does not have to be missing, either. Because truly, when we engage with what the spiritual scientist is able to give from the spiritual world, even for such a period as the life between death and rebirth, it can indeed be understood. We need only a finer, subtler understanding than the coarse understanding modern human beings employ in many cases for the outside world. Steiner refuted the claims Moritz Benedik who claimed that a small occipital lobe in a child led to adult criminal behavior. To the contrary, Steiner claimed that education can compensate for a small occipital lobe by activating the etheric occipital lobe. Here is an early sign of Steiner's focusing on the importance of childhood education(5). [page 42] The etheric occipital lobe is just as effective in life, maybe even in a certain sense more effective, as the physical occipital lobe, because it must overcome a certain force. And the comfort then streams forth from our knowledge that the physical form of an occipital lobe is not the only thing that matters. Rather, if we notice those who have this or that disposition to do wrong, we can develop the etheric lobe of such people, whose occipital lobe is too small, by evoking specific feelings in them. Then we will be able to save them. He began to understand that the grey reality of materialism revealed the need for childhood education which will not only greatly help them in this lifetime, but will carry on through their succeeding lifetimes. This would be a demonstration that "spiritual science engages us practically in life". [page 42] One can see, arising from what spiritual science can give us, the consoling possibility of actively engaging in what people become. If we can observe at the right moment certain tendencies in a child that could lead to criminal behavior, then we will be able especially to develop through a certain type of education the aspect of the etheric that affects the occipital lobe particularly strongly. Thus we could weave this strength into people, which then lives on with them between death and rebirth. This would develop the occipital lobe especially well, even into the physical nature in the next incarnation. We help them not only for this incarnation, we also create the disposition for an especially well-developed brain, which they can then carry through the life between death and rebirth, to be incorporated in their next bodily incarnation. When people ask me who Rudolf Steiner is today, I ask them if they have heard of Waldorf Schools, and most of them have. This is something real which people can see and believe for themselves. Steiner said in Lecture 2 in 1916, "Pedagogy is especially bleak today because people believe only in what humans are physically; pedagogy especially must be stimulated by spiritual science." He was talking himself into readiness for forming Waldorf education when a few years later Emile Molt asked him to speak on education to his factory workers in the Waldorf-Astoria Cigarette plant in Stuttgart. What he told the workers caused them to beg their boss, Herr Molt, to begin such a form of education for their children. Factory workers did not understand spiritual science, but they understood the importance of educating their children based on the principles Steiner elaborated based on his spiritual science. Steiner understood that the spirit was working in children, but saw that the materialistic approach to childhood education was egregiously wrong. [page 43] [We should be] seeking the spiritual where it is working, for instance, in children — where it should develop. Pedagogy must be stimulated there. Pedagogy will become living only if people reach the point of cultivating a sense, a feeling, for the spiritual, so that the teacher not only gives every kind of pedagogical instruction but also, above all, is intent on observing the potential of the individuality to see what wants to develop from it. This must be achieved, really achieved! In pages 50 and 51, Steiner reveals that we should consider our skin as an inner spiritual aspect of our face and our stomach as an external spiritual aspect. We humans went through a process whereby our organs which were on the outside of our body were moved internally and our skin was moved externally, a complete inversion like turning a glove inside-out. Next he points out that our physical body, while we can verify with our senses that it becomes part of the Earth after death, this is not completely true. Only the chemical elements of the physical plane and the warmth element of the spiritual plane return to the Earth. The real physical body is like a phantom, similar to a dress maker's form, which holds the elements and warmth together while we live on Earth, and this phantom, the rest of our physical body, returns to its designer's studio, if you will, upon our earthly death. [page 52] The rest pulls away from what sinks into the earth through decomposition or combustion and is taken up into the whole cosmos. When you think of all that you can sense in the environment surrounding the earth, with all the planets and fixed stars, and when you think of this process as spiritually as possible, then in this spiritual thinking you will have the place in us where our spiritual essence is. Where we do go after death? We enter a spacious mansion which has been prepared for us. [page 52] Upon our death we are submerged quickly, lightning-fast, into what formed the physical body from all of the suprasensory forces. You should imagine that all of the creative forces that have worked on your physical body since the Saturn period expand out into the infinite and prepare the place where you live between death and rebirth(6). All of that had been simply concentrated in the space enclosed by our skin between birth and death. Death from this side of threshold may seem frightening to some; from the other side it is experienced as a glorious birth into the spirit! We are free at last! [page 53] If death has something frightening about it, it is only because it is seen here as an extinguishing, so to speak, an end. From the other side, from the spiritual perspective, when we look back to the moment of death, death appears evermore as the triumph of the spirit, the wresting free of the spirit from the physical body. It appears as the greatest, most splendid, most meaningful event. And our I-consciousness after death awakens from this event. for the entire period between death and rebirth, we have an I-consciousness that is not just similar to, but actually a much higher sense than the one we have here in physical life. During our life on Earth, we live in a microcosm enfolded into our body, an entire cosmos which, upon death is unfolded and surrounds us. Only one space in this cosmos appears empty, the place we occupied in the physical world. This is a space which fills us with a feeling that we must occupy it again, and again. [page 54] And then we attain the feeling that we have a reason for being in the world, a purpose that only we can fulfill. We sense our place in the world. We sense that we are a building block of the world, without which the world could not exist. That is the vision of this void. When we look at this void, we are overcome by the fact of our belonging to the world. What is the meaning of our experiences in the physical world? We are seeding the universe with each of our experiences. Like the seed does not know the farmer who plants it in the garden, we do not know the spirits of the hierarchies who plant us and weave our experiences into the universe. When we look another human in the eye, we can catch a glimpse of those hierarchies at work. If you have looked into the eyes of a person and had your entire life changed by that look, you have seen the hierarchies at work in your life. [page 57] When you meet other people and look them in the eyes, the spirits of the hierarchies live in their gaze and in what their gaze transmits back to you; the work of the hierarchies lives in it. What we experience presents only the outer side to us; the gods work within the act of experiencing. And whereas we believe that we live only for ourselves, the gods are working something out through our experiencing, until they have something that they can then weave into the world. We have conceived thoughts; we have had emotional experiences; the gods take them and share them with their world. And after we have died, we know that we have lived so that the gods can weave together what comes from our etheric body and give it over to the whole universe. We must as human beings come to understand the big lie which we have been so carefully taught: that we humans have always been the way we are now! This leads to all kinds of fallacious conclusions about what it means to be a full human! We cannot understand the evolution of human consciousness if we accept this big lie! Unchallenged, it will lead humans to a poverty of soul. [page 67] And what informs us today from the material world as the course of the spiritual history of humanity is essentially nothing more than an outright lie. One is led to believe that human beings have always been the way they have become in the last few centuries, whereas it was really not so long ago that they saw into the spiritual world with clairvoyance. But they had to abandon this ability to see the spiritual world, because they were not free. In order to obtain full freedom and I-consciousness, it was necessary to give up this sight. And now, we must find our way again into the spiritual world. Briefly humans were able to directly see into the spiritual world with clairvoyant sight, but in the course of evolution this ability was dropped so that we might become free; having achieved this freedom, we now seek to have this supersensible sight while maintaining our freedom. This is the goal of Rudolf Steiner's spiritual science as stated in the title of Lecture 4: "to overcome today's poverty of soul" — a poverty which arrived when we lost our direct view of the spiritual world. The Greeks and Romans of the fourth cultural period had reason for no reason at all! In other words, they were born with reasoning ability like we are born with hands. [page 71] The Greeks and Romans were dependent on their reason in a different way from people of today's fifth cultural period. As part of their natural state of evolution the Greeks and Romans received reason to the extent they needed it. Just as today natural dispositions develop as human beings mature, in a certain way natural reason developed then in them. This was very different from the way it is today. People then did not have to develop natural reason in the same way as is necessary today — and which will become more and more necessary in our fifth period — it developed then as a natural ability. People either had reason, if they developed in natural conditions, or they did not. If they did not, it was something pathological. It was also exceptional; it was not usual. People came together into relationships quickly; they didn’t need as long a time to do this as we do now. In our fifth cultural period, however, we no longer need direct personal contact to work out things together; printing and other modern means of communication and travel have fostered very impersonal contact with others. [page 74] In Greco-Roman times, it was still the case that when two people met, each person immediately made an impression on the other, and the impression had a very strong effect. Now, so that the more isolated consciousness soul in people can develop, it should be more like this: one person meets another, and what emerges as a result of previous incarnations should gradually become more effective. This takes longer than immediate acquaintance at first sight; it implies that people, little by little, let what they have experienced with the other come up instinctively, feelingly. That is exactly what is called for today: that we get to know each other gradually, so that the sharp edges of our current outer personalities are smoothed down. For in this way of becoming acquainted, in this smoothing down of our individuality, lies the rise of still-unconscious, instinctive reminiscences, the consequences of our previous incarnations. One can read modern day romance novels and notice the various unexpected and tortuous paths that people take on their way to knowing one another. Such romance novels would have made no sense to the Greeks and Romans in the intellectual soul age(7). We have moved into the consciousness soul age with a new form of social understanding. [page 75] More and more a sense for social understanding must be awakened in this fifth cultural period, and awakened consciously, because we live in the age of the consciousness soul. That one term summarizes needs that were by no means present to the same degree during the fourth cultural period. Animals have a group soul which is determined by blood relations. Humans in the consciousness soul age must transcend their age-old traditions based on blood relations. Many novels are written which illustrate the friction resulting from attempts to be free from one's blood relatives and their traditions. [page 76] Human beings must grow beyond the group soul. Every single person must develop individually; and especially in the present day, the consciousness soul is one of the essential parts of this individual development. This material requires study and my summary of it may be insufficient to convince you; if so, you may need to study Lecture 4 yourself. The important point is that a knowledge of the consciousness soul will give us a practical knowledge about human nature and a guide to helping develop our children — those newly arrived beings from the spiritual world — to achieve the individual goals they have brought into this lifetime. One can be sure of this: their goal will not be to adopt their mother's role nor to take over their father's business. That time is mostly past. Where it exists today, it is an anachronism left over from the fourth cultural period, the intellectual soul age. What does the remnants of the intellectual soul age of the Greeks and Romans bring us as social understanding? 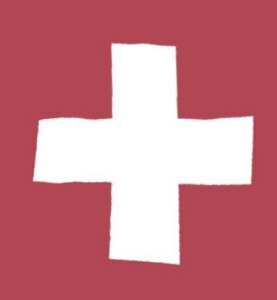 Only this: abstract ideas about the world, such as socialism and the authoritarian rules of various groups to govern our lives. Rightly understood, that time is truly past. [page77] If we really tried to introduce into the world such social ideas as are appearing here and there, we would soon see that we cannot accomplish it. Social understanding is not in any way about founding societies or sects with certain agendas, but about spreading knowledge of the human being, practical knowledge of human nature. Our means of educating children is based on traditions, both old ones and new ones, new ones which are being formed every year. Such a bulk application of wisdom to raising children today will not suffice! Our children need individual attention to the aims and goals they arrived here with — this is what helping them develop must mean to educators from now on. Clearly, it was thoughts such as these which led Steiner to devote the last years of his life to helping Waldorf schools and teachers develop: he saw it as necessary to prevent the bogging down of humans in fourth cultural period pedagogy and to help foster goals and pedagogy appropriate to fifth-cultural-period humans in the consciousness soul age. [page 77] This means knowledge of the human being that enables us to correctly understand nascent, developing human beings; to understand children correctly and the way they each develop with their own individuality. Where are we most likely to encounter stagnation of social understanding in this fifth cultural period? One place is in the religious confessions. Christian dogma is notoriously entrenched and change comes about with great difficulty and very slowly. Steiner warns that religious life is doomed if it does not adapt to our current period. [page 79] Something further must begin in this era if the consciousness soul is truly to develop. If religious life will not adapt to the fifth cultural period but chooses, rather, to remain as was correct for the previous period, a certain stultification, a true deadening of religious life will begin as we become more and more individual. Over the period of a hundred years since Steiner gave this lecture, have we not seen this deadening of religious life advance as people have become more individual in their choices? Are not people beginning to carry Christ in their hearts and souls rather than in their prayer books and hymnals? [page 79] In fourth cultural period, people could be taught about Christ in groups; in the fifth cultural period, Christ is, in fact, entering into individual souls. We all carry Christ in our unconscious or subconscious already. But He must first be brought again to consciousness within us. That does not happen when established, rigid, lifeless dogmas are imposed upon people. It happens, rather, when everything possible is attempted to make Christ understandable to all people and to foster religious knowledge for all. Thus more and more tolerance must come about, directly in relation to the thinking of religious life; it must come about in this fifth cultural period. In this fifth cultural period, we should seek a spiritual life and understanding completely free from the stultifying effect of religious dogma. [page 80, italics added] Now, because people are becoming ever more individual, religious life should support the attempt to become completely free from dogma; should really bring before people the things that can be explained, can be described to others, without dogma. This will come about more from personal inner experience, so that people can individually develop their own, free religious thought life. In reality, the religions with dogmas, with specific set dogmas and tenets, will kill religious life in the fifth cultural period. Another way of saying the above is that we must eradicate Jesuitism and the faith in authority that it promulgates and strives to keep alive in humans indefinitely. It acts to tie us as humans to the fourth cultural period and to keep us from maturing naturally into the fifth cultural period. Our beloved Schnauzer knew how to help himself. This came home to me when he began spending entire days outside under the shade of the bamboo copse and refused to come inside or interact with us. We thought he might be dying, as he was near the end of his natural life span of 10 years, so we left him alone. After about a week, he was normal again, eating and interacting with us again. Steiner says on page 81, "Animals have many instincts that lead them in beneficial ways from sickness back to health. . ." Humans on the other hand seem to helpless compared to these animals with no reason at all! Most people cannot make a move without consulting a doctor at the slightest malady. They have given up their natural sense of individuality to someone else, a doctor, and submitted themselves to a medical authority, much like people in the Middle Ages submitted themselves to religious authorities like bishops and priests, following their advice on matters of health and faith without hesitation or question. Steiner points to the morphing of the average human from having faith in religious leaders to having faith in medical and physical scientists. While this may seem to be a significant change, it is merely substituting a new outside authority for an old outside authority, thus constituting no change at all so far as evolution of consciousness is concerned. This appearance of change leaves most of humanity mired in the fourth cultural period. [page 82] . . . humanity today works hard against common sense regarding sickness and health. In this way, humanity today submits completely to authority. It is not easy for modern humanity to even form an opinion regarding healthy living conditions. Certainly, all sorts of organizations, and such, make laudable endeavors. But these endeavors must all become much more intensive. Above all, we must understand that we are continuously moving toward a faith in authority, and that entire theories are formed that are themselves the foundation of views that strengthen this same faith in authority. In the field of medicine, in the field of jurisprudence, and in all other fields as well, people declare themselves incompetent from the start in acquiring an understanding, and they simply accept the word of science. This is indeed understandable given the complexity of modern life. But people will become increasingly more helpless under the influence of the power of such authority. Such authority comes to us as Ahrimanic strictures such as Jesuitism which flourished during the fourth cultural period . Such authority appears in the papacy, in medicine, in science, and leads us to an onerous faith in such strictures as climate change causing people to spend enormous sums of money as a society on such things as "reducing carbon footprint". I cannot help but compare the scientists today — who pronounce climate change and global warming to be scientific facts which everyone must accept — to bishops in the Middle Ages who declared that papal proclamations were to be followed without questioning by all the faithful. The folly of the religious faithful of the Middle Ages — buying plenary indulgences for their sins — has appeared in this age with the buying of carbon offsets to continue the corporations's industrial sins(8). Steiner gives us a look at the effects of Jesuitism when it first appeared. [page 82] Jesuitism first began to uphold the power of the papacy in the field of ecclesiastical doctrine, which carried over from the fourth cultural period into the fifth. But the papacy is no longer suited for the fifth period. This same Jesuit principle, however, is also carried over again and again into other areas of life. Today we can see Jesuitism looming even over the medical field, which is essentially nothing other than Jesuitism transferred from dogmatic religion. Doctors who know nothing about Jesuitism are benefitting from its advance into the medical field. They are directed by authorities from above to give narcotics to patients for the simplest procedures or tests. Even dentists prescribe them for things like X-raying teeth. They have recently been required to use a lower threshold for high blood pressure which requires them to give blood-pressure-reducing medicine to a much larger percentage of their patients. [page 82] We see how from a sort of medical dogmatism doctors strive for an increase in the power of their status as doctors. And that striving for power is the essential thing about the Jesuit-like aspiration for power in various other fields as well. This will become ever stronger. People will become increasingly more constricted by what authority imposes upon them. People today are subjected to the paradox that I call, "The Betty Crocker Approach to Life". On the front of a Betty Crocker Cake Mix box I saw the words: "Be Creative! And Here's How to Do It!" Now consider that well-intentioned advice and you will notice that if you follow another's advice, you are definitely not being creative. [page 84] Many people see what I have described and feel it is necessary, really necessary, for people to come to social understanding, on the one hand, and freedom of thought, on the other. But few are willing to take the correct measures; people often attempt to promote what is necessary for social understanding with all kinds of idealistic sounding phrases. Idealistic sounding phrases like "Be creative and here's how you do it!" People fall for these phrases and follow them for lack of any idea of how to be really creative in their own life. The situation was so bad in Steiner's time for the education of children, that after giving a speech about education, he was talked into helping create a proper pedagogy for small children, leading to Steiner's helping found the first Waldorf School in Stuttgart. [page 84] So much is being written today on the necessity of individual treatment for the young, growing human being! What elaborate theories are being conceived in all possible pedagogical fields! That is not what this is about. What should be spread widely, and in an understanding way, are what I would like to call positive natural histories of individual human development — as many descriptions as possible of how a human being has developed. Wherever we can, we should say how person A, person B, and person C have developed, and enter lovingly into the details of an individual's development taking place before us. This is necessary above all: a study of life, the will to study life, and not simply to follow a program, because theoretical programs are the enemy of the fifth cultural period. Here are the theoretical programs he is talking about: academic courses, scientific theses on childhood development, etc. What he is recommending instead is that we pay attention to the individual life of each child and adjust our teaching to their needs, not following a one-method-fits-all approach to teaching. Spiritual science does not make us into an authority, but rather teaches us to be discriminating, to be able to discern the hidden forces in each human soul as it shows itself in the child in the classroom. It does not make us into physicians or scientists, but enables us to judge what a physician or scientist recommends. [page 86] We will not know everything an authority knows; but if the authority does a particular thing in an individual situation, we will be capable of judging that. . . . Once people understand what I mean by these words, then they will understand much about the healing forces for this era. It is really significant when I say that spiritual science will transform human understanding so that people will become discriminating, and the power of understanding is freed up out of their soul-life. Only in this way can they truly achieve freedom of thought. Christ has been a part of our earthly existence since the Mystery of Golgotha, which is fortunate for us. But Steiner asks us to consider the situation of the angels, for whom Christ had departed. For the angels this departure was not so fortunate, but we humans in our Christ-like thoughts shine a light into the spiritual world of the angels which brings them joy. [page 87] Human beings say, "Christ has permeated us, and we can develop in such a way that Christ will live within us; 'not I, but Christ in me.' " The angels, on the other hand, say, "Christ went away from within our sphere, but he shines up to us like so many stars in the Christ thoughts of individual people. We recognize him there, he has shone from earth since the Mystery of Golgotha." By becoming Christ-filled people we can face off against the so-called authorities of today who are merely anachronisms from the previous fourth cultural period. This is the help which comes to us from studying spiritual science, and we do not need supersensible sight to benefit from it. [page 87, 88] Help comes to us from the spiritual world when we study spiritual science. It is not just what we learn, the knowledge, but the beings in the upper hierarchies themselves help us if we know about them. Moreover, when we face authority in this era, it is beneficial for us that we have supporting us not just our own human understanding, but also what the spiritual beings are able to affect in our understanding when we know about them. They enable us to judge with regard to authority. The spiritual world helps us. We need the spiritual world; we must know about it; we must take it in deliberately. This is the third impulse that must occur in the fifth cultural period. What are the three impulses which bear fruit in this current cultural period? First, it is social understanding; second, the freedom of thought; and third, the living knowledge of the spiritual world through spiritual science. (Page 88) Steiner realized that such a small group around him were imbued with spiritual science, that something had to done to broaden the reach of spiritual science, in effect, to create a seed-bed in which knowledge and application of spiritual science could be planted, be nurtured, and could bear fruit in maturity. This seed-bed came into being when Steiner founded the Waldorf pedagogy. It is a pedagogy which helps create social understanding and freedom of thought in our youngest members of society so that they may develop on their own a living knowledge of the spiritual world from which they have so recently arrived. Nowhere in the Waldorf School curriculum can one find a course in spiritual science, but the teachers' knowledge of spiritual science allows them to teach the children directly without any authoritarian strictures which could spiritually deform their children(9) . As a child, I was puzzled by everything I encountered in the world around me. I wanted to learn how the world worked and that resulted in my majoring in physics at the university. I didn't want to build things, that's what engineers do; I wanted to know the principles which lie behind what engineers do. As an adult I learned to design and build computers, but always I was interested in the bootstrap effect: "How do you get the program loader into a computer?" This is a paradox: the program loader is a program, and how can you load a program if there's not one already in the computer? It's like lifting yourself by your own bootstraps! It's an enigma. The bootstrap metaphor is the origin of our saying, "booting up" or "rebooting" a computer. There must be a bootstrap program already in the computer or else a human being must enter it in by hand. If it's already in the computer it had to be created by a human when it was manufactured. What about human life? Where's our bootstrap program? Where is the equivalent to the computer's "human" when a human being is created? I began to see life as a puzzle with an enigma on each end. There must be life already before we are born and life must continue after we die. In Steiner's spiritual science I found the answer to my two enigmas in the process of serial reincarnation of human lives. I found in the evolution of the cosmos, the workshop in which spiritual beings fashioned human beings out of their own substance. And as the cosmos evolved through its various stages, human beings evolved as well until we reached the current Earth stage of evolution where we are born into a new life carrying the results of our previous life and have an opportunity to balance the karmic debts we incurred in the previous lifetime. When we die, we spend time between death and a new birth preparing for our new life. This book of lectures has helped me to understand more fully this process of serial incarnation, especially what happens between death and a new birth. In Lecture 5, "Karmic Effects", Steiner explains why the enigma of life is so important to us. [page 95, 96] Human life must at first be an enigma for outer physical view, because if it were not an enigma, human beings would not be subject to a development that makes us ever more capable. Our abilities, which are produced especially in connection with the soul, must come from our own efforts; they grow out of our efforts. In the spiritual realm, our efforts make us mature through the energy that we devote to solving the riddle of the world. By devoting energy to solving this riddle, our strengths are fortified; we become ever more capable in life, and we truly become perfected also within humanity's evolution. We need not worry that life will lose its interest for us when someone partially solves the riddle posed by the physical world and is able to look into the spiritual world, because life poses riddles in every realm. Upon entering the spiritual world, one finds still other riddles of life. We also gain something in relation to the physical world specifically from the experiences we have solving certain human and life riddles from within the spiritual world. We gain trust and experience through the solving of the deeper human and world riddles that are revealed only in the spiritual world itself. Truthfully, I can say that I have never lost interest in life, even after reading, studying, and writing reviews of over 217 books of Rudolf Steiner's works and lectures. There is always some mind-boggling revelation awaiting me in the next book. With each book I read of his, I find solutions to long-held unanswered questions of mine, and create a few new ones. What is destiny? This is the most-overused and misunderstood word that I know of. Like the word freedom, it can mean almost anything the speaker wishes it to. If you add the adjective karmic to it, it becomes easier to home in on what it means. Karmic destiny refers to time in which you or I are living and can be considered as the set of karmic debts we have accumulated since our previous lifetime and how we have planned to balance these karmic debts in this lifetime. Easy definition: karmic destiny is our individual plan for karmic balancing during our current lifetime. [page 96] One particular riddle is what human beings experience between birth and death as destiny. A great deal is packed into this word "destiny." Yesterday in the public lecture we were able to touch on how the matter of destiny is resolved through repeated earth lives. When my brother David died over a decade ago, I missed him, but I knew he was going to be busy in the spiritual world. I have wondered what he might teach me when I meet him in my own time between death and a new birth. Steiner explains how this might happen by giving us an example. [page 98] We notice that much is arranged differently according to the difference in time between the two deaths. When we enter the spiritual world, it is not the same to meet a person who died at the same time we did (to take this extreme case) as one who died fifteen years earlier. If the one we meet has already spent a certain time in the spiritual world, then the experiences he has had in the meantime are now in the soul that we meet, and so that soul affects us in a different way. A karmic bond is made accordingly that could not have been made in the same way through other conditions. We must see all of what we experience in this way with a person who is close to us as being completely based on our karmic relationship. I have said many times that, even if this knowledge cannot assuage sorrow and pain, for us to know what happens when everything fits together, what happens when everything interacts, it still must be said from a certain viewpoint that life takes on its true meaning only when seen as a whole in this way. When David died, he had been busy carving wooden duck decoys. I asked if I might have one of his unfinished decoys. 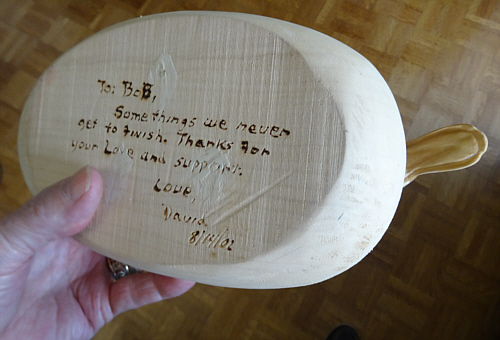 He said yes, and inscribed the bottom with this, "Some things we never get to finish . . ." It was sad to think of those unfinished things then, but by now he realizes that in his time between death and a new birth, he has been given a chance to finish those things he was thinking of, the least of which was the decoy on which he wood-burned the message to me. Along with Steiner, I have come to understand life as a series of riddles to be solved, a set of "unfinished things" which we, who live ever in the middle of eternity now, are challenged to finish, either in our life between birth and death or in our life between death and a new birth. [page 118] To think clear, incisive thoughts about this purifies our souls in such a way that we can also be strong when contradictory outer forces plague us. If one thinks about the matter within a limited horizon, one could say, "But what good does it do me to become really clear about what divides anthroposophy from the rest of the world? My life conditions will not change by doing so!" To think in this way would be a mistake. Although life conditions may not change from one day to the next through clear thinking that produces understanding; nevertheless, the strength that we gain from such clear thinking, in the way I just indicated, gradually strengthens us in such a way that our life conditions do, in fact, change. It is just that we sometimes do not find the opportunity to develop really clear, incisive, and therefore strong enough thoughts of this kind. Strong, clear, and incisive thoughts are difficult to conjure up when we live in a culture driven by a big lie! [page 118 italics added] With regard to what we would like to gain for ourselves through spiritual science or anthroposophy, and what we would like to gain not just for ourselves but for the world, we must bring before our souls as one of these clear thoughts that in today's culture humanity lives in a terrible, more or less conscious or unconscious lie, and the effect of this lie is immense. What is this big lie of which most people are unconscious? The big lie is what is missing from our culture, namely, sufficient impulses for life. How else might one explain the enormous increase in suicides in the world? These are people who lack sufficient impulses for life, people whose curiosity about the great mysteries of the world were never aroused by the state school system which is driven by purely materialistic concerns in their pedagogy, people who bought the big lie that they were told everything about the real world and find that everything is meaningless, so they check out of life early, disgusted by the emptiness their schools so carefully taught them how to find and too timid to seek for a fullness of meaning to life. Given all this is true, what is the most important thing humanity needs today? It is the same as when Steiner spoke these next words, likely even more important now. [page 119] But for the most part, these people live under the restrictive influence of a certain constraint that comes from unconscious timidity, unconscious spiritual cowardice in regard precisely to the most important thing that humanity needs today. We say: the most important! What humanity needs today is spiritual knowledge, and the introduction of certain spiritual insights into our lives. What keeps this from happening? The big lie does. Theologians originally had truths about the soul, but materialistic science came around after Bacon and claimed there was no soul, that nothing was real unless one could see, weigh, or measure it. Since the soul lacks these three attributes, the theologians lost the truth of the soul, leaving them instead with truths about words instead of truths about real objects in the eyes of natural scientists who insist that only material objects can have truth. [page 132] They will even let the objects be investigated by natural science, because theologians are too comfortable in many respects to really take up natural science now. And that is what we must see as important in spiritual science: that this spiritual science takes up natural science completely; that it becomes involved in all that natural science has acquired and joins in by adding spiritual-scientific principles to the natural-scientific mode. The theologians did not want to do this; at times they are filled with a very strange conviction, precisely when it comes to retaining the objects. 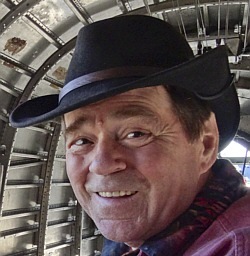 This is what spiritual science means to Steiner: a science that goes further than materialism and dares to accept all the tenets of the material sciences and merge the tenets of spiritual science into helping us understand how certain processes which seem to operate mysteriously in the material world, can be explained by the teaching found in spiritual science. Just to name one: doctors today disdain the human organ known as the spleen. Ask a doctor if the spleen is important and you'll likely get a response, "No, we can remove it surgically with hardly any effect." And yet, rightly understood, the spleen is a highly spiritual organ and operates a central control for the human body. It is so spiritual that removing the physical organ hardly makes a noticeable difference, to doctors. What happens when someone takes an afternoon nap and wakes up refreshed after about 18 minutes? The peristalsis of the abdomen creates rolling waves which pass next to the spleen, giving the spleen a wonderful internal massage. This creates the sense of well-being in a person after such a nap. Various exercises in the gym and elsewhere can have a similar effect, but these are not noticed because such exercises are performed to build up muscle tone, muscle strength, endurance, etal. [page 136] We know that people are in a transitional period today. We do not mean this in the superficial sense in which people now speak of transitional periods, but in another sense. We are in the transitional period in which the old atavistic-clairvoyant instincts have died away, and in which conscious entrance into the spiritual worlds must be achieved. That is an obvious fact for spiritual scientists. The old atavistic-clairvoyant abilities that people had also gave them powerful thoughts. History tells little of these powerful thoughts, which greatly influenced human life in the third cultural period. However little they stand up today in our estimation, they did stand up in that time. Influential thoughts — our time must recover thoughts again that are capable of influencing reality! But they can do so only if they are also fructified by the spiritual world, as thoughts were in ancient times. But people today are not made fruitful by way of the unconscious. Thus consciousness must arise if people are to really accept spiritual-scientific knowledge. This paragraph inspired me to write this poem, which I entitle "The Mask of Play". We mentioned above the tradition in earlier times that a boy usually took up his father's trade. My grandfather was a barber for 60 years, from 18 until he retired at 78. My father never worked officially as a barber, but with four small boys and a limited paycheck, he cut our hair till we were old enough to pay for our own haircuts. I learned enough about barbering to trim my own hair between trips to the barber, so some of my grandfather's skills came down to me. This custom is disappearing today. I know of one family in which the trade of butchering has been passed down multiple generations because my grand-daughter is married to a man who took over butchering from his grandfather at the family store which has been in the family a hundred years. But this is the exception rather than the rule today. Fathers who are lawyers and try to force their son into becoming a lawyer are often thwarted by a son who has other ideas. One prominent example was Petrarch whose father sent him to an Italian university to become a lawyer. Petrarch dropped out of law school saying, "I did not want to make a machine out of my mind." This is a powerful statement from the nascent consciousness soul of Petrarch. His very soul rejected the career chosen by his father and he was conscious of why! [page 154] People knew earlier, when they sensed more of the actual reality of spiritual worlds, much more about the necessities that exist for life as a whole. They knew that the living need the dead; need the impulses of the dead, even in their habits. Think back to earlier times, when it was the custom for the father to ensure that the son took over his business; that the son carried on in the same way. A connecting bond was formed through the physical world because the son had followed in his father's footsteps; a relationship was created between the activity of the son and the activity of the father, and the father continued to have an effect in the son long after the father had died. Just as fathers today should not force their own choice of career on their sons, people should not impose changes on the inner nature of mature people. We can all agree with this injunction, but Steiner explains this is only applicable while we are living between birth and death. The rules change during our time between death and new birth. [page 155] Strange as it may seem, we become truly mature enough only after our death to affect other people directly by having an effect on their inner nature. What we should not do in earthly life — impose our own habits on another person who is mature (I mean spiritually mature, not mature in the customary sense) — is actually proper after we have passed through death's gate and fulfills the requirements for the continued evolution of humanity. When we mature to the level of Intuition in our time between death and a new birth, we can act to maintain the continuity of evolution by influencing the I of those living upon Earth. [page 157] Human beings can have intuitive effects on other beings in this sense (that is, on beings who are still embodied here in physical life) only when they have laid aside the astral body, when they themselves belong wholly to the spiritual world; that is, decades after their death. Then they can have an effect on other people through intuition, too, and not just through inspiration as I have described. In this way they first have an effect spiritually as an I that is now in the spiritual world in the I of one who is still on earth. Before, they had worked as inspiration into the astral body, or indirectly through the etheric body into the etheric body, of earthly people. One who has been dead for decades can, as an I, have a direct effect, which of course can also be mediated by the other bodies at the same time. Then the person's individuality has grown to be able not just to settle into people's habits, but actually into their viewpoints! This may be an uncomfortable, a quite unpleasant reality to today's prejudiced sensibility; but it is simply a reality. Our viewpoints, which originate in the I, are continuously under the influence of those who are long dead. Those who are long dead live in our views. But through this, the continuity of evolution is maintained by the spiritual world. This is a necessity; otherwise, the thread of viewpoints would be continually broken. 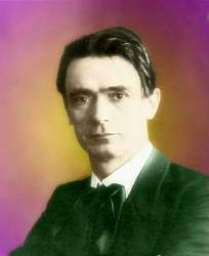 One of the amazing things about Rudolf Steiner is that he never tried to acquire followers. He simply gave lectures on things he understood and answered questions. When Emil Molt asked if he would help found a school for the children of the employees of his Waldorf-Astoria factory, he agreed and the first Waldorf School was created by others. When someone wanted to form a church based on spiritual science principles, Steiner helped them start the first Community Church. Always these endeavors were suggested by someone else who then carried on the project he helped them to start. He wrote about four or five books personally, but from the beginning, his lectures seemed so important that someone in the audience voluntarily recorded them in shorthand, a practice which continued and has resulted in over 300 books consisting solely of lectures of his. No one recruited me to anthroposophy anymore than to physics, it was my own curiosity which led me to spiritual science and physical science. If someone asked me, "Are you a follower of Rudolf Steiner?" I would have to say, "No" because the idea of being a follower of his is completely alien to his work. What he strove to understand during his life and shared with others, I have picked up to learn and understand and apply in my life, as have so many other people. In Lecture 7 he explains why a true spiritual scientist cannot become a propagandist for the cause of spiritual science. [page 157, 158] Those who are quite honestly grounded in the esoteric, and who are experienced in the requirements of spiritual science, will not impose their opinions on the world. Instead, such individuals do everything not to directly impose their opinions on the world because the opinions acquired under the influence of one's personal temperament will be able to have an effect only thirty or forty years after one's death. They have an effect such that they enter the soul in the same way that the impulses of the zeitgeist, the archai, enter the soul. Their personal views have become so mature that they can really have an effect and correspond to the objective course of things. That is why it is necessary for those who are grounded in esotericism to avoid making personal proselytes or personally recruiting followers for their opinions. The general custom today (that once people acquire an opinion, they can hardly wait to make propaganda for it) could not be striven for by a true, practicing spiritual scientist. In Lecture 8 Steiner explains our relationship to the spiritual world and is worthy of deep study. He handles several unanswered questions. Why did we have atavistic clairvoyance at one point in human evolution, why did it go away, and will it come back again? He answers: only with a completely fluid body is imaginative perception possible. The small amount of solid matter in us interferes with clairvoyant perception. In this fifth cultural period we will naturally develop this supersensible sight again. [page 161] First, I would like to comment on the fact that perception in the elemental world can take place only when human beings are able to free themselves completely from what makes them earthly humans. This disengagement from what makes a human being an earthly being is, generally speaking, not difficult. However, it is more difficult for human beings today than it was in prehistoric times. We all know of prehistoric atavistic clairvoyance. This was primarily so because humans could free themselves from what made them earthly humans. As earthly humans, we are composed of only a very small amount of solid matter. We are made primarily of fluid. In the moment when we can emancipate ourselves from what is solid in us, when we can just feel into the part of ourselves that is fluid, the imaginative aspect can begin to surface. Existing only in a solid state actually prevents us from knowing through imaginative perception about what is around us as the elemental world. This imaginative perception, which has been lost, will indeed return to humanity. The lost imaginative clairvoyance from the past was of an unconscious, dream-like nature; what will form more and more in our fifth cultural period is a fully conscious imaginative seeing that will incorporate itself into people through completely natural development. What is illness? How do our materialistic views prevent us from curing illnesses? He answers: there is some irregularity in our inner system, but the materialism which binds medical science prevents it from removing the irregularity. Illness can be compared to someone who tries to dance, but cannot because her legs are bond together. [page 162, 163] What is called illness today is, in truth, only the outer physical picture of what is actually there. In reality, in illness some irregularity is present in what I have compared with a planetary system, and the illness is only a reflection of this irregularity. We could say that those who know such things should begin teaching theories on healing illnesses today. We could say Hic Rhodus, hic salta! ["Prove what you can do, here and now! "], and esotericism should show its skill here. Indeed, esotericism will do so the moment its legs are cut free, because one cannot dance if one's legs are bound; and the binding of the legs is the presence of contemporary materialism, which has occupied all of medical science. This cannot be improved by one or the other person performing isolated actions, but it will come about only by a large number of people who, through their common will, are strong enough to bring about such a system of medical practice, one that incorporates spiritual principles. How can we judge other people properly? We can strive to do what those in the spiritual world do naturally: move our judgment from the person to Lucifer and Ahriman controlling a part of the person. [page 166] It is simply the nature of those who have passed through death's gate to acquire this tolerance, and to always see that part of a person has the luciferic or ahrimanic aspect. The departed do not see a bad person who follows evil desires; rather, they see that Lucifer is a certain part of the person. They do not see a jealous person; rather, they see that Ahriman is a certain part of them. That is how those who live between death and birth, judge. In this lecture, Steiner describes how our departed loved ones remain connected with us during their time between death and a new birth. Note that the word 'departed' is a misnomer because they are closer to us during this time than when they were in a physical body on Earth and lived in the next room, next door, in the next city, state, or country. A mere thought of them brings them into our presence. If we allow the thought of them being departed to create a feeling in us of grief, these loved ones will feel an incredible pain due to our being oblivious of their immediate presence with us at that very moment. [page 175, 176] I have made it my main task today to describe a bit the way in which the souls who have passed through the gate of death have an effect in the world, if people with whom the departed had been connected in the physical body have remained behind. And you have thus also seen from another perspective that the world is truly a connected whole; that the dead are, in truth, dead only to outer physical sight. In the instant that they pass through death's gate, they have another kind of access to our souls, and that is the entire difference. They now have an effect on us from within, whereas when they were living they affected us from the outside. Such things should more and more become not just external theories, but should settle into human consciousness; should become not just a world idea, but rather a worldview; indeed, I mean to say, a world perception. Then spiritual science will bear the fruits it should bear, and which it is capable of bearing. [page 177] We also want to be at one with such feelings by considering them to be the most intensely connecting feelings. The close, invisible community of those devoted to anthroposophy will gradually bring this into the world: this holding together, this oneness, in the perceptions and feelings that are born out of the ideas of spiritual science. The world needs this invisible community of souls that is able to carry into the world the forces of such unity as has been characterized. In this sense, we will be together in the future in the spirit, though we are not together physically for a time. And thus it should be with us always: that our spiritual unity carries our physical unity evermore. As I read this final paragraph of the book, the song by Peter Scholte rang through my ears, "We are One in the Spirit" like this: "We are one in the body, we are one in the spirit." We carry physical unity and spiritual unity with us forever. We, you and I, dear Reader, will be together in the spirit, even when we are no longer physically together. Edward Reaugh Smith's Burning Bush, page 414. The collective psyches of residents act as "steering currents" for hurricanes, something no meteorologist can account for or find in weather data. See The Individual and the Nature of Mass Events by Jane Roberts. A photo of the artwork appears in Rudolf Steiner's book Art History on page 164. This event occurred about two years before Steiner gave this lecture, so it was fresh in his memory and enough time had passed for him to notice the effect of the boy's etheric body on the artistic construction of the large wooden building of the first Goetheanum, which was designed and sculptured by Steiner. There is only one book of lectures he gave earlier than those in this book. It covered the period 1906-1911: The Education of the Child. It includes an Essay he wrote about 1916 summarizing his informal early talks on education of children. The main thrust of his focus on education began around 1919 and he spent much of his last six years of life lecturing on Waldorf Education. See this listing of his writings on education: http://www.doyletics.com/arj/waldorfducation.html. Note how this process is revealed in the Bible, see John 14-2 which says, "In my Father's house are many mansions: if it were not so, I would have told you. I go to prepare a place for you." The fourth cultural period was the time of the Greeks and Romans and the intellectual soul age. The fifth cultural period which began in the 15th century is the time when our current consciousness soul age began. Note: In lectures where the phrase "post-Atlantean era" appears, in my quotations of the text I have changed them to "cultural period" for simplicity and consistency. Buying carbon offsets is done by corporations so they can attempt to mask their actual carbon output. One is reminded of the barbarous procedure of foot-binding which physically deformed the feet of Chinese girls. Authorities allowed it until recent times because it was thought to produce beautiful women.